The golf course is a great place to smoke a cigar. What other sport is it acceptable for a competitor, with hundreds of thousands of dollars on the line, to light up a fine stogie mid-competition? You’re outdoors in presumably good weather, free (for the most part) of smoking bans, and playing a game with very long pauses in action. Still, there are a few things to consider when selecting a smoke for the golf course. 1. Length — There’s really no cigar too long for golf. Even if you’re just playing nine holes, you’ll probably be out there for two hours. This is the time for those toros, double coronas, and Churchills that you otherwise might not have time to smoke. 2. Ring Gauge — There’s a lot to like about thin cigars, but generally you’ll want to shy away from lanceros, panatelas, and coronas. Thicker cigars tend to have a sturdier ash and a more consistent burn. On the course, you’ll want a smoke that won’t completely destruct if it gets dropped. Usually 50 ring gauge and larger can handle the rigor of the links better. 3. Strength — You don’t want a cigar so strong that you need to sit down while you smoke it. On the other hand, you also don’t want a cigar that’s too mild to enjoy without your complete attention. That’s why I usually grab medium or medium- to full-bodied smokes when I’m playing. 4. Price — While everyone has their own definition of an expensive cigar, I’m of the thought that pricey cigars have no place on the golf course. When you’re playing golf, a cigar is a secondary activity. That means it’s best to leave the special occasion smokes at home and bring something that offers value instead. 5. Number — How many cigars to bring on the course is a matter of personal choice. With a typical round going five hours, two or three cigars is probably about right (and you’ll be glad you have that third one when you’re stuck behind a particularly slow group). In addition, think about bringing a few extra smokes to give to your fellow golfers. You may be slowing the group down with your horrible putting, but they’ll be glad you came along when they’re enjoying the fine cigars you generously shared with them. Remember that smoking a cigar on the course won’t lower your handicap. But by following these few simple rules you may find that you’ll enjoy your round of golf more than ever. I nominate the LFD Air Bender as a great golf cigar. Not only is it great tasting, but the ash holds on like it's made out on concrete, at least on the Valiente vitola. Great advice! I recommend a Padron 4000 maduro, or if you're into "hog Legs" the 7000. Even if your round is filled with lip outs and hosel rockets, you'll enjoy a good smoke. If The LDF Mr. Jones wisely suggested or the Padron is too strong check with the Betty White League at my track, they might have a slot open. Hope all your greens are one putts! Your article presumes that we remain free to smoke cigars on golf courses. Tragically, I'm not confident that we can make such a presumption. Regis, I’ve never been to a golf course that bans cigars. Doesn’t mean it won’t or doesn’t happen. I’ve just never seen it. Patrick, I couldn’t agree more with your top 5. 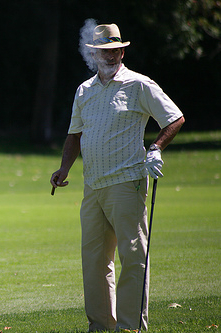 I smoke 50% of my cigars on the course. If I’m playing 18 I usually wait till lunch at the clubhouse and smoke a medium- bodied stick on the back nine (Monte Whites and Rocky Edge Lites are my faves), and occasionally a full-bodied stogie after dinner. I always bring enough cigars for my golf buddies, actually more than enough, so that they can choose their cigar and aren’t forced to take what’s left over. That being said, it’s a great way to dispose of certain cigars I’m not looking forward to smoking! Not a big Cigar smoker but the amount of golfers I see puffing away on a sun shining day on the green surprised me. I'll definitely be mentioning this to a few of my golfing friends!